吴永杰, 何兴成, Shane G. DuBay, Andrew Hart Reeve, Per Alström, 周华明, 和梅香, 雍凡, 张文文, 雷富民, 冉江洪. 贡嘎山东坡的鸟类多样性和区系[J]. 四川动物, 2017, 36(6): 601-615. WU Yongjie, HE Xingcheng, Shane G. DuBay, Andrew Hart Reeve, Per Alström, ZHOU Huaming, HE Meixiang, YONG Fan, ZHANG Wenwen, LEI Fumin, RAN Jianghong. Avifauna of the Eastern Slope of Mount Gongga[J]. Sichuan Journal of Zoology, 2017, 36(6): 601-615. *通信作者 Corresponding author, 吴永杰, E-mail:wuyongjie@scu.edu.cn; 冉江洪, E-mail:rjhong-01@163.com. Abstract: Based on 5 field surveys from 2010-2017, and review of previous studies, we summarize the occurrence of 336 bird species on the eastern slope of Mt. Gongga, including 204 residents (60.7%), 89 summer visitors (26.5%), 18 winter visitors (5.4%), and 25 passage migrants (7.5%). There are 205 species (61.0%) of Oriental origin, and 105 species (31.3%) of Palearctic origin; 26 species (7.7%) are widespread. Two hundred and forty-five species (72.9%) belong to the order Passeriformes, and 293 species (87.2%) breed on Mt. Gongga. There are 3 Class-1 and 29 Class-2 nationally protected birds, and 53 birds from eastern Mt. Gongga are endemic to Hengduan-Himalaya region. Three species are listed on CITES Appendix Ⅰ and 25 species are listed on CITES Appendix Ⅱ. One species is classified under the IUCN category EN and 2 species under category VU. Our study shows that species from the Oriental origin on average have a lower elevational distribution than Palearctic origin species, indicating that differential adaptation to high elevational environments between Oriental and Palearctic species may be due to different biogeographical histories. Of the 53 endemic species, 51 are of Oriental origin have higher elevational lower limits, midpoints and upper limits than non-endemic species, suggesting that endemics are better adapted to highland environments, which may be associated with their endemism. Species richness of birds peaks between 1 800-2 800 m elevation in mixed coniferous and deciduous broadleaf forest as well as in mixed coniferous broad leaved forests. Species richness decreases at lower and higher elevations, showing an overall hump-shaped richness pattern. Bird communities and vegetation structure change markedly across the elevational gradient of Mt. Gongga. 图 1 贡嘎山东坡繁殖鸟类垂直分布 Fig. 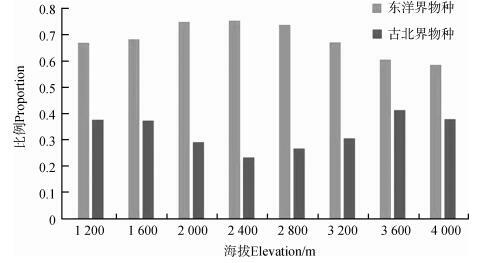 1 Elevational distributions of breeding birds on the eastern slope of Mt. Gongga 每条线表示一个物种的垂直分布范围，线中点代表该物种的垂直分布中点，物种根据中点海拔值由小到大排序；红色.东洋界物种，蓝色.古北界物种，黑色.广布种。	Each vertical line represents the elevational distribution of a species, and the midpoint of each line represents the midpoint of the species' elevational distribution; red. Oriental species, blue. Palearctic species, black. Cosmopolitan species. Notes：Protection status：Ⅰ. Class Ⅰ nationally protected birds，Ⅱ. Class Ⅱ nationally protected birds；IUCN：LC. least concern，VU. vulnerable，NT. near threatened；CITES：Ⅰ. appendix Ⅰ species，Ⅱ. appendix Ⅱ species；Endemic species：E. 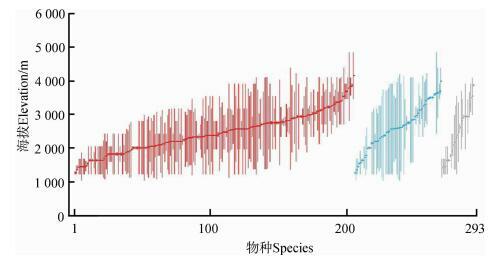 species mainly distributed in the mountains of China in breeding season，T. montane species mainly distributed in the Hengduan Mountains，eastern Himalaya，and the mountains on the Indo-China Peninsula during the breeding season；Fauna：O. Oriental species，P. Palearctic species，W. widespread species；Distribution type：according to Zhang (2011)；Occurrence status：R. resident，M. passage migrant，S. summer visitor，W. winter visitor. 程根伟, 罗辑. 2002. 贡嘎山亚高山森林自然演替特征与模拟[J]. 生态学报, 22(7): 1050–1056. 高学斌, 赵洪峰, 罗磊, 等. 2009. 太白山南坡夏秋季鸟类组成[J]. 生物多样性, 17(1): 19–29. 胡锦矗. 1984. 四川资源动物志[M]. 成都: 四川科学技术出版社. 雷富民, 卢建利, 刘耀, 等. 2002. 中国鸟类特有种及其分布格局[J]. 动物学报, 48(5): 599–610. 李晶晶, 韩联宪, 曹宏芬, 等. 2013. 珠穆朗玛峰国家级自然保护区鸟类区系及其垂直分布特征[J]. 动物学研究, 34(6): 531–548. 沈泽昊, 方精云, 刘增力, 等. 2001. 贡嘎山东坡植被垂直带谱的物种多样性格局分析[J]. 植物生态学报, 25(6): 721–732. 沈泽昊, 刘增力, 方精云. 2004. 贡嘎山海螺沟冷杉群落物种多样性与群落结构随海拔的变化[J]. 生物多样性, 12(2): 237–244. 唐蟾珠, 徐延恭, 杨岚. 1996. 横断山区鸟类[M]. 北京: 科学出版社. 翁笃鸣, 罗哲贤. 1990. 山区地形气候[M]. 北京: 高等教育出版社. 吴永杰, 雷富民. 2013. 物种丰富度垂直分布格局及影响机制[J]. 动物学杂志, 48(5): 797–807. 吴永杰, 杨奇森, 夏霖, 等. 2012. 贡嘎山东坡非飞行小型兽类物种多样性的垂直分布格局[J]. 生态学报, 32(14): 4318–4328. 约翰·马敬能, 卡伦·菲利普斯, 何芬奇. 2000. 中国鸟类野外手册[M]. 长沙: 湖南教育出版社. 张荣祖. 2011. 中国动物地理[M]. 北京: 科学出版社. 郑秀灵. 1984. 中国自然地理——气候[M]. 北京: 科学出版社. 中国观鸟年报编辑. 2016. 中国观鸟年报-中国鸟类名录4. 0版. (2016-03-13). 周华明. 2014. 贡嘎山保护区鸟类[M]. 成都: 电子科技大学出版社. Alström P, Olsson U. 1999. The golden-spectacled warbler:a complex of sibling species, including a previously undescribed species[J]. Ibis, 141: 545–568. Alström P, Olsson U. 2000. Golden-spectacled warbler systematics[J]. Ibis, 142: 495–500. Gill FB, Donsker DB. 2015. IOC world bird list (v 5.4)[DB/OL]. DOI:10.14344/IOC.ML. Hu W, Wu F, Gao J, et al. 2016. Influences of interpolation of species ranges on elevational species richness gradients[J]. Ecography, 40(10): 1231–1241. Kreft H, Jetz W. 2013. Comment on "an update of Wallace's zoogeographic regions of the world"[J]. Science, 341(6144): 343. Li Z, He Y, Yang X, et al. 2010. Changes of the Hailuogou glacier, Mt. Gongga, China, against the background of climate change during the Holocene[J]. Quaternary International, 218(1): 166–175.